you need to know the width of your menu items, both in normal and hover state. 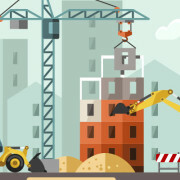 After creating a single JPG file out of photoshop we will use a fairly common technique called CSS Sprites to display the menu. By creating a navigation using an image sprite, you can have a complete navigation with rollovers by only using one image. My menu will contain 4 menu items, each 40px high, 125px width in normal state and 200px on hover state. So I will create a new .psd file with the dimension of 800px x 80px. The width is the result of the hover state multiplied with the number of menu items (200 x 4), the height is two times the menu height: we will display the hover state of the menu item directly below the normal state. Now create a new layer, select black (this is important for later) as foreground color and draw a rectangle which fills the upper half of your file. Then double click the layer in the Layers palette to open the layer styles, select Gradient and apply a gradient with the foreground color #959595 and #d0d0d0 as your background color. The result should look similar to the the picture above. Opacity should be 100%. 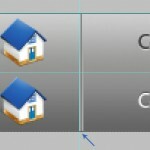 To center the text pixel perfect horizontally as well as vertically select the marquee tool and draw a rectangle. Thanks to the layer guides the rectangle will snap into position and have the exact same height and width for each item. Then select the move tool and hit the align buttons for align vertically and horizontally. Repeat this for each menu item. Next we will add the icons for the hover effect. I used the famous “Bright” Icon set by Min Tran. 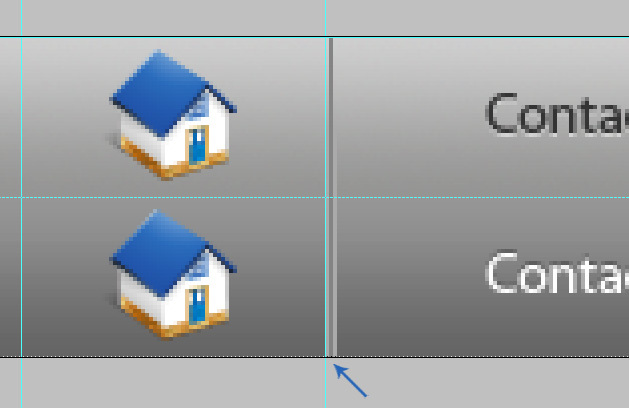 These icons should be applied between the 125px and 200px guide. After doing that create a new folder in the layer palette and put all layers created until now into this folder. Set the drop shadow to -90Â° and the color to #000000. The image above shows you how your image should look now. To add the borders between the menu points select the line drawing tool and set the foreground color to #969696. Select the pixel mode and remove the checkmark from anti alias. This is needed to draw a exact line of 1px without any blur. After drawing this line from top to bottom of the image go to the layer style palette again and add a border of 1px, color: #b8b8b8, position outside and set the Blend Mode to Lighten. After doing thatÂ align the borders directly beside the layer guides as seen in the picture. The pseudo class “:hover” is added to the list item and not to the <a> tag. Since Internet Explorer 6 can only work with this pseudo class when applied to an <a> tag we define an extra active class which accomplishes the same. This class will be automatically added by the jQuery script on hovering. You might ask yourself why I didn’t style the <a> tag with the background image to circumvent this problem. I do this because of the round corners which I will apply later on. I could have done it anyway with a little bit of extra HTML markup but I want to keep the HTML as clean as possible. It’s truly only a matter of preference. If you intend to create a menu without round corners you can apply the background images, as well as the offsets directly to the <a> tag. You can define many more parameters, a comprehensive list can be found at the plugin page at the documentation tab. First you should add layer guides again for pixel perfect alignment. Select black as your foreground color and draw a rounded rectangle (8px radius, anti alias:on). Now move rectangle 2 and 4 out of the canvas until you only see the round corners. Crop the image so that only the round corners can be seen. Can I replace “kwick” in my css and html code by another word, for example: “menu”??! WordPress: Display Content in multiple Columns New Laptop?